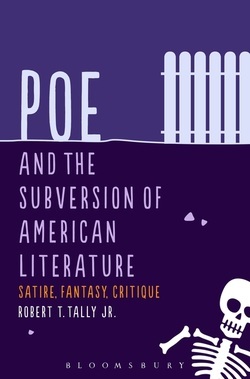 Poe and the Subversion of American Literature argues that Poe's writings represent forms of satire, fantasy, and critique that subvert the nationalist project of American literary studies. Subversion not so much in the overtly political sense—Poe was no revolutionary, of course—as in the almost geological sense, of undermining or eroding the foundations of such a project. Drawing upon Gilles Deleuze's famous distinction between nomad thought and state philosophy, Tally argues that Poe presents an alternative to American literature through his satirical critique of U.S. national culture and his otherworldly projection of a postnational space of the imagination. Tally begins by noting that Melville and Poe represent alternatives visions of a post-American condition. Where Melville projects a supra- or transnational world beyond the imaginary geography of the nation-state, Poe descends to the street-level or to the underground of everyday experience, begetting an infra-, sub-, or even anti-national perspective. Both writers are at odds with the tradition established by twentieth-century American Studies, a tradition that has canonized each, though quite differently. And both writers offer ways of re-imagining literature in the "post-American Century" today, in the era of globalization. Poe and the Subversion of American Literature reads Poe's life and works as postnational forces that undermine not only the national narrative of his own time, but the nationalism of twentieth-century American Studies, while opening tenebrous vistas into our own postmodern condition today. a book devoted to Poe (in whole or in part) and his place in the institution of American Literature like Robert Tally’s. And Tally’s book, solely on Poe, as the advantage of being able to demonstrate for the entire career how Poe systematically subverts the exceptionalist myth of America’s manifest destiny. It is very likely to shake up American Studies, as well as rightly to put Poe and his all-encompassing irony once again at the symbolic heart of modern literature. One of the best books I have read in a long time." "Theoretically rich and empirically compelling, Tally’s study makes a knock-down case for Poe the Descendentalist: anti-American unmaker of epistemologies, cities, democracies, missions, selves, narratives. Reading across a wide range of literary genres, Tally conjures up a subterranean Poe, nomadic Poe, oceanic Poe, Deleuzian Poe, streetwalking Poe, slyly calling the poete maudit back from his premature burial to erupt in an afterlife of perverse joyous mockery. This study forever makes the stately apparatus of American Studies fall back into the worldly maelstrom of Poe’s uncanny figurations." book, we see satire and mockery as the best elements of an American literary tradition." "Robert Tally’s brilliant new book on Poe restores him to his prominent place in the development of American literature and honors his transgressive achievement. Tally is not just an astute critic but also a wonderful, finely honed writer, and his book will be required reading for Poe scholars and fans alike."